This construction video tutorial demonstrates the types of foundations or footings in construction. Based on the transmission of load to ground, the foundation is mainly divided as Shallow Foundation and Deep Foundation. Shallow Foundation: Shallow foundations stand for the foundation in which the depth of the settled foundation remains under the width of the foundation (D < B). Shallow foundations are usually defined as spread footings because they pass on the load of the super structure laterally into the ground. Wall Footing: This type of foundation operates continuous along the direction of the wall and facilitates the load of the wall into the ground. Wall footing is useful where transferable loads are small and inexpensive in dense sands and gravels. Under this type of foundation the width remains 2-3 times the width of the wall at ground level. Usually, wall footing is built up with stone, brick, plain or reinforced cement concrete. Column Footing: Column footing is ideal for the depth in excess of 1.5m. It is also inexpensive. The base of the column is expanded under this type of foundation. 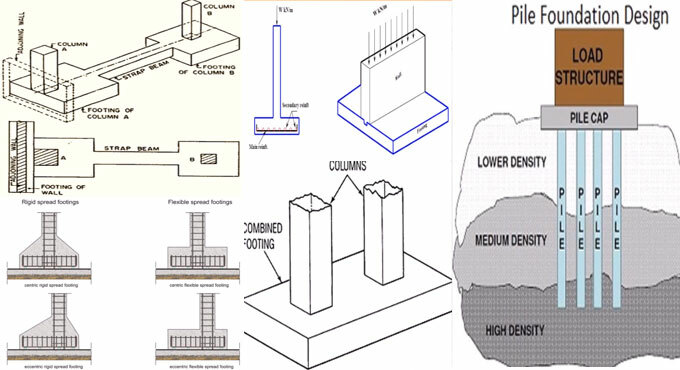 Column footing comes in the form of flat slab and built up with plain or reinforced concrete. Combined Footing: Combined footings belong to the foundations which are created common for two or more columns in a row. It is mostly suitable if the footing for a column may expand away from the property line. It is built up if the two columns are narrowly positioned and the soil on which the structure rests on contains low bearing capability. It may come in rectangular or trapezoidal shape. Strap Footing: When it is not possible to expand an edge footing away from the property line the edge footing is connected with the other interior footing through a strap beam. Such footings are known as strap footing or cantilever footing. a) Permissible bearing pressure is low. b) The structure contains heavy weight. c) The site comprises of extremely compressible layer. a) Flat slab type. b)Flat Slab thickened under column. c) Two way beam and slab type. d) Flat slab with pedestals. e)Rigid frame mat. f)Piled mat. You can also watch the following video tutorial for getting more information.